At 06h30 on the morning of 30 May 2017, our guests from Tent 9 at Wilderness Safaris Xigera Camp were on their way to the main area, only to confront this amazing road block – a young female leopard! They went back into their room and sounded their air horn. 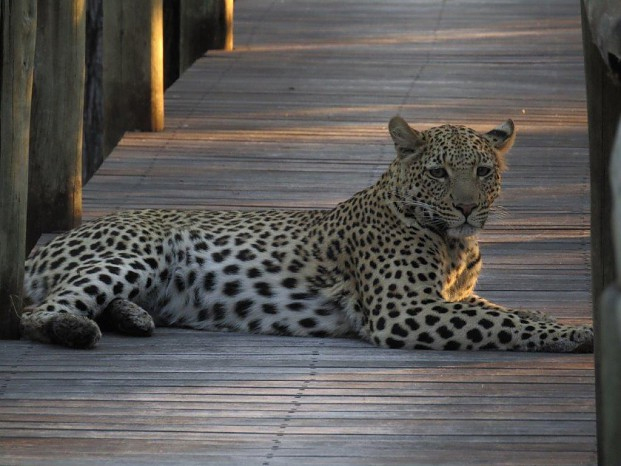 We were at the main area when we heard it and ran to their room, we found the leopard sitting on the walkway to Tent 9. She did not care about us being there as she was preoccupied with a bushbuck. After watching it for 30 minutes the cat walked to the guests’ room and they watched her as she passed by their door.